This year’s Customer Contact West conference was held at the Arizona Biltmore in Phoenix. I really enjoy this event every year. It’s a smaller conference, I believe around 350 attendees, but the events and content are huge! The format of the sessions are great. 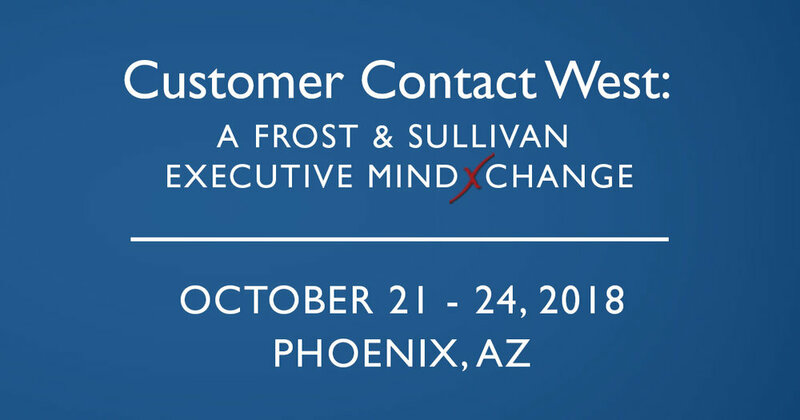 The Frost & Sullivan team does a great job mixing up keynotes, general sessions, interactive sessions, panels and roundtables so there are so many opportunities to learn and connect with other customer contact and customer experience leaders. The biggest trends that seem to dominate every contact center and customer experience conference are around artificial intelligence and machine learning and how they are already starting to re-shape the ways customers interact with businesses. There were a number of speakers that touched on what’s being done today and how advances in AI will continue to change our industry. Another trend that seemed to come up throughout the week was around video. From BT using personalized videos to help walk customers through their first bill, the Sacramento Kings, who last year were named one of Fast Company’s “Top 10 Most Innovative Companies in Sports" seeing sales success with video, or Blue Cross Blue Shield of North Carolina testing video to proactively answer customer questions about their Explanation of Benefits, it seemed that video was on a lot of people’s minds. One more trend that also kept popping up was around knowledge, and how we as leaders need to get the right information in front of our team members in a way that is easy for them to retrieve and at the time when they need it. In nearly every session there was discussion about the need to make improvements in employee knowledge systems and how just throwing content at employees wasn’t going to cut it anymore. Joseph Bocanegra, ZipRecruiter - As a startup, there was an expectation that every customer interaction should have a knowledge base article that goes along with it. If there wasn’t already one, the team member would start the process of getting one documented. I was also impressed with how ZipRecruiter creates opportunities for team members to take on small pieces of new responsibility which allows for more “half-step” promotions. Nate Brown, UL & CX Accelerator - There is real value in looking at employee level effort score, and the foundation of low employee effort is having a strong knowledge management system. Nate also shared how making it easy for employees to share customer comments, by giving them a CX button, could really deliver a ton of useful data. Nate also shared his top takeaways from the conference. Gabriele Masili, Microsoft - Artificial Intelligence doesn’t mean you have to take the employee out of the picture. Technology PLUS People = low barrier to entry. (Also, congratulations to the Microsoft team for your three CC Awards! There are always a number of new technology solution providers at every event and this year was no exception. This year, the tech that really had my attention was Tethr. Not just because I had the honor of meeting Matt Dixon, the author of The Effortless Experience and Customer Experience rock star who serves as Tethr’s Chief Product & Research Officer, but because it’s a slick technology that takes call recording and voice analytics to the next level. A few months ago I was working with the content team for this conference and they asked if there were other people that I thought would be a good presenter for the event. I promised them that they wouldn’t be disappointed if they found a way to get Nate Brown there. In addition to Nate’s great presentation on the Metrics of an Effortless Experience, he and I put together an interactive session where we put the 15 year old voice of the customer methodology on trial in what turned out to be the most fun I have ever had as a presenter. With Nate as the defending attorney, I took the role of the prosecutor (most of my arguments came from this article from Bob Hayes). There were opening statements, oral arguments, witnesses and cross examinations, and questions from the jury (our audience). In the end, we asked the jury to vote and the verdict came down in favor or NPS. One of the most common arguments in favor of it was that the value is in the program you put behind it, not just the methodology. Who Manages CX In Your Organization? I also had the honor of sitting on a panel with Nate, Samantha Starmer, and Jeffrey Laird, moderated by Rachelle Dever. The topic was around where CX transformation sits within an organization and how to effectively improve CX even if you’re not the CxO. My fellow panel members were brilliant - I can’t wait to catch the video and the notes when they’re published! And it wouldn’t be a Frost & Sullivan event without the wild and crazy Olympics event on the last night of the conference. Our team played hard but we did not end up with a medal. There’s always next year! On the final day of the conference we ended with an site tour of GoDaddy in Tempe, who really went out of their way to deliver an amazing experience for us. They gave us great access to their facility and showed us around while answering all of our questions. They have a world class operation and it was wonderful to meet some of their leaders and team members. The caliber of leaders that attend this conference is unparalleled. Every year I meet so many bright and talented people and I learn so much from them. I’m excited to continue the conversation with many of them. If you’re looking at adding a conference to your schedule for 2019, I highly encourage you to attend one of the Customer Contact events (East, West, or Europe).